Commercial flight simulators have helped and assisted potential pilots in becoming control and operate prepared before guiding a large aircraft thousands of feet in the air. It has aided in the facilitation in the transition from teaching to reality. In essence, these devices are video games taken to the next level, but serve a much higher purpose in pilot training. However, this technology is not “new” and “of the age”; its been around since the early 1900s and has since technologically progressed into the incredible tool it is today. The first approaches to flight simulation began in World War I when aircraft pilots designed a system to teach new pilots the skills of “deflection shooting” while remaining safely on the ground. Firing at moving targets requires an immense amount of concentration, mathematical angles, and proper timing. 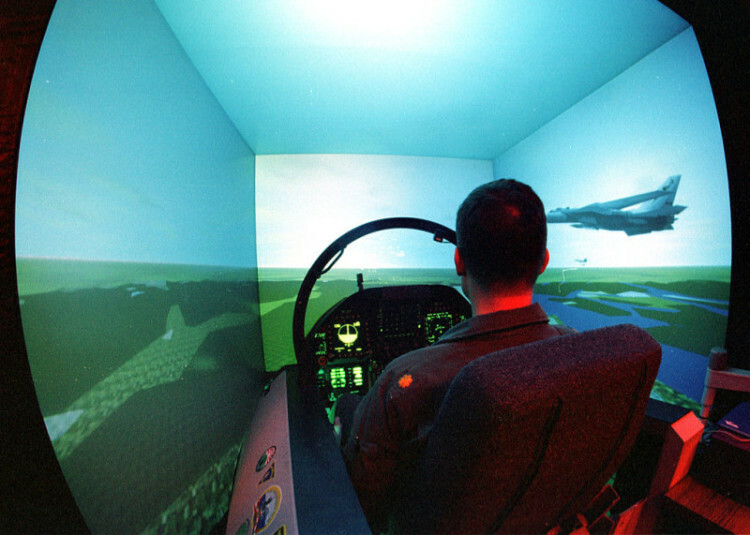 In order to reduce stress and flight anxiety, the first ground-based simulators were built in order for combat pilots to target practice. Years later, throughout the 1920s, more promising simulators were constructed, the most famous of them known as the Link Trainer produced by Edwin Link. These simulators were quite literally grounded planes and painted in its famous blue color, hence the slang name “blue box”. Edwin link, an amateur pilot himself, was dissatisfied with the amount of real flight training that was available to trainees, which made him seek education by other means. His ground base device served that purpose, and accurately demonstrated flight controls and real life circumstances without having to worry about the restrictions of weather and aircraft availability. The design was built upon a pneumatic motion platform, which accurately represented the flight motion of a plane when the wheel was turned and the cockpit was equipped with replicas of working switches, nobs, and toggles that an actual aircraft model would posses. Initially, aviation schools and military branches had no interest in Edwin’s “Link Trainer”, but the need was soon realized after the US Government contracted the Army Air Force to fly postal mail under legal obligation. This meant that pilots were required to fly in any weather condition, which many were not prepared for. Thus, the need for proper and safe training on how to handle an aircraft during unpleasant climate was highly necessary, and thus the “Link Trainer” was officially adopted and patented in 1929. Furthermore, the link trainer served even larger purposes of combat training when World War II fell upon the United States in the 1940’s. Over 10,000 simulators were produced and somewhere near 500,000 pilots were trained on this device in the allied nations. Later adaptions came to the program when the Celestial Navigation Trainer allowed for an entire bomber crew to be safely trained together on a flight deck, instead of just a single man. Flight Simulators today, though they have the same essence and end goal, have changed rather drastically because of the advancement of new technology. The largest flight simulator currently available in the world is the Vertical Motion Simulator at the NASA Ames Research Center in Silicon Valley. This device has a heave system that allows for the lateral movement of the simulator cab, and also permits the cabins to be easily interchanged on the platform. This then allows for training on a multiple variety of aircraft devices and models, which have ranged from blimps, commercial flight, military operations, and even space shuttle training. This is groundbreaking, because previously each aircraft had to construct its own individual simulator, but now, the cabin can be interchanged on a single device. Today, the further progression of flight simulators are a blessing, because they allow a learning pilot to get behind the wheel, or wing in this case, without coming face to face with the real and present dangers of jet aerospace. This device artificially re-creates aircraft flight and the environment in which it flies, whether that is for commercialized airlines and travel or for drones and other militaristic operations. How does it help? Well, it includes replicating equations that govern how aircrafts actually fly and how those equations regulate flight controls to affect the aircraft system. In other words, everything that could be experienced while flying is present in a virtual reality, including flight factors such as air density, turbulence, wind, clouds, precipitation, pressure, and so on. Not to mention, there are significant skills required when flying a plane, all of which are too risky to learn firsthand on an operating jet in the air. Pilots are required to make assessments on the spot and respond to an ever changing surrounding on top of handing all those complex switches and nobs on the dash. It’s difficult to say the least. Therefore, simulators lead to handling an actual aircraft through a safe “trail and error” practice. The goal is to expose the training pilot to real, harmful situations that may occur in flight, but without the actual danger of being miles above the ground when it happens. Hopefully, with training, pilots will be experienced through the simulator and be conscious of what to do when these obstacles hit in real life. 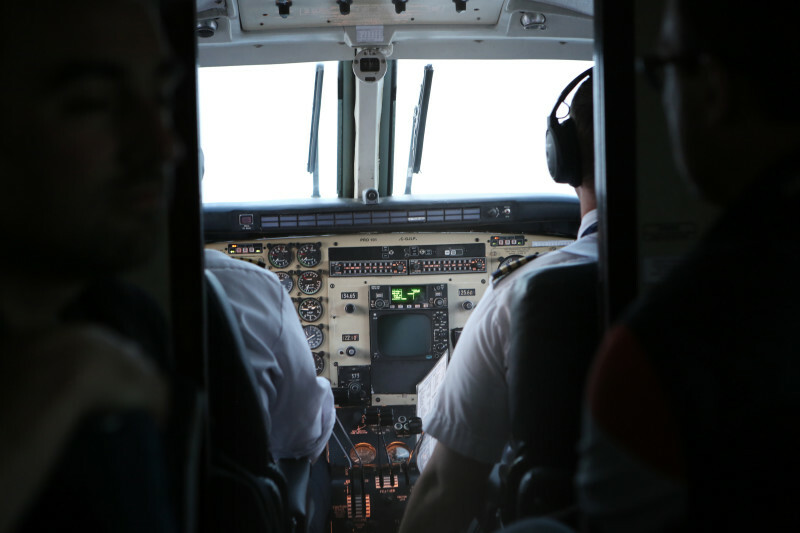 Here, at Aeroflite, we understand the importance of protection and well-being, which is why we admire the procedures of flight simulators and their goal to fully secure their budding pilots. Photo Credit: “LinkTrainerSeymourIndiana” by Unknown photographer – Licensed under Wikimedia Commons.